In 1909, Scotland was caught up in a second craze for roller skating which swept right round the world. Roller skating had also been popular over 20 years before but by 1909 there were better roller skates using ball bearings with fibre wheels and the floors were of maple wood instead of concrete or asphalt which greatly improved the skaters' experience. 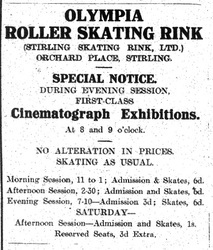 By the time the Olympia Roller Skating Rink in King Street, Stirling was opened on 4th November 1909, there were already many rinks opened in Scotland and in the rest of Britain e.g. Bannockburn had one several months before Stirling. Roller skating in Stirling was offered over three sessions, 11:00am to 1:00pm, 2:30pm to 5:00pm and 7:00pm to 10:00pm, Monday to Saturday. 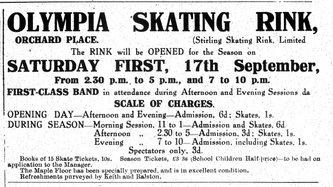 Admissions for the morning session were free, skate hire being one shilling. 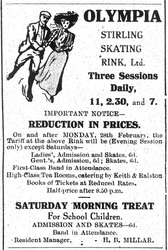 In the afternoon and evening, ladies were given a better deal than gents, with admission and skate hire still one shilling, while gents paid one shilling and six pennies. 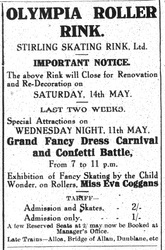 The management were clearly attempting to offer a mixed social occasion with a band in attendance supplying popular music and partner only skating sessions. Children were only catered for with a special Saturday morning session. 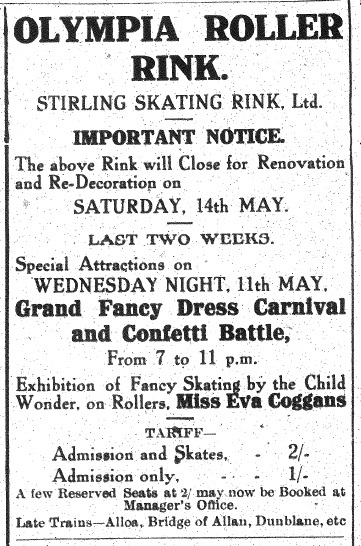 The roller rink also arranged carnivals with fancy dress at various times along with special events such as sports nights. Admission and skate hire prices were more expensive for these. Roller Hockey was played by the staff and then a club was formed and their matches became part of the programme as a spectator attraction. On 28th February, 1910, prices were reduced for evening sessions (except Saturday) with half price sessions after 8:50pm in a bid to increase the number of skaters. The rink closed for refurbishment on Saturday 14th May and it would have been regarded as a very successful first season. 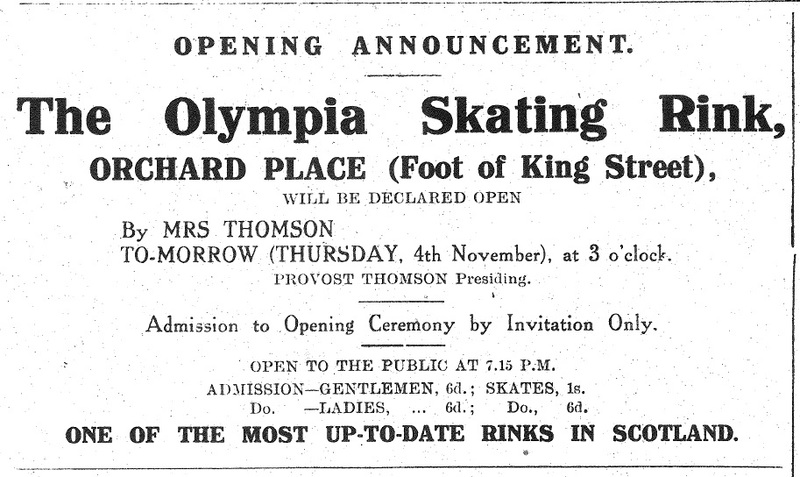 The rink reopened on 14th September 1910 with reduced prices overall, but no free sessions and no cheaper prices for ladies. Spectators were admitted for three pennies. 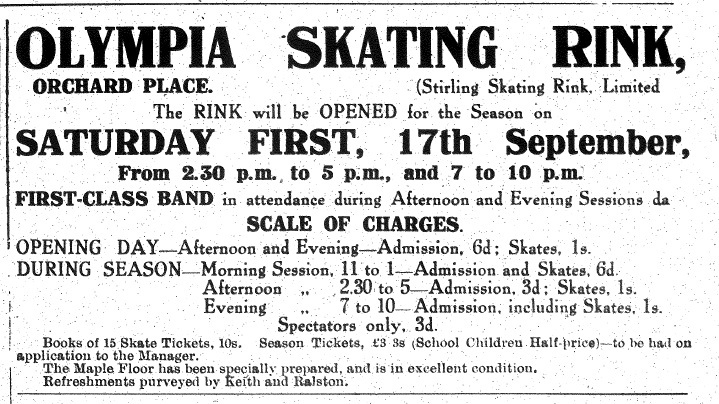 By December 1910, the prices for admission and skate hire had been reduced to nine pennies for the evening session and six pennies for the others in a bid to get numbers back up. This was almost half the price of the original charges. The Roller Hockey club had ceased to be an attraction by this time due to lack of members. At the end of 1910 and into 1911 entertainment was introduced at intervals during the evening sessions. This started with cinematograph shows and then wrestling exhibitions were also staged. This was clearly to boost admissions with spectators. 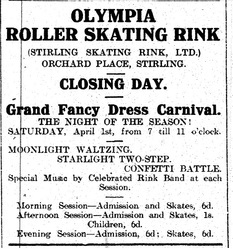 On 28th March 1911, the Stirling Observer Rinking Notes column announced the closing of the roller rink on 1st April. A Glasgow firm had taken it over and were to convert it into a “Picture Palace” to continue the cinematograph shows there. There was no closing ceremony on the night, the band simply played ‘Auld Lang Syne’ as their concluding number. 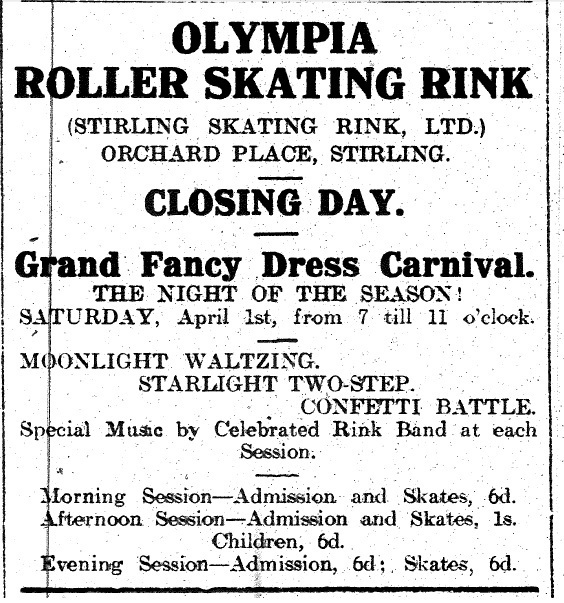 Roller skating had come to an end in Stirling. 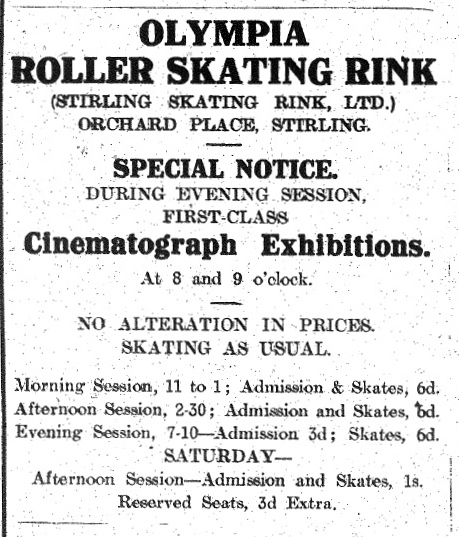 Elsewhere in Scotland, the collapse of roller-skating was also happening with equal speed. 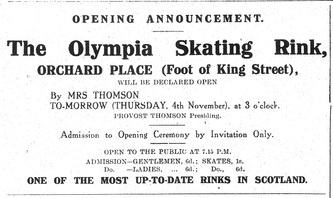 Hinckley Olympia Roller Skating Rink.